Hortus Camdenensis | Acacia paradoxa DC. Spiny, usually erect and bushy, sometimes spreading shrub with half ovate phyllodes to 2.5cm long and masses of axillary, globular flower heads, to .5cm or so across, with bright yellow flowers all along the branches. To 3m. [RHSD, Hortus, Hilliers', FNSW]. ‘A hardy greenhouse shrub. Discovered on the south coast of New Holland, by Robert Brown, Esq. Introduced in 1803. Flowers from April to June. Propagated by cuttings. Our drawing was taken from a plant communicated by Messrs. Loddiges and Sons, in 1811. We were favoured with specimens of the same in May last, from Messrs. Lee and Kennedy.’ [BM t.1653/1814]. Considered a most desirable greenhouse species by Johnson’s Dictionary. 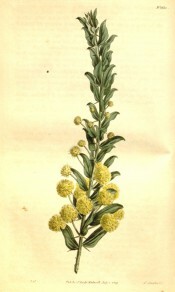 Acacia armata is marked with a ‘c’ in an 1836 edition of Loddiges’ catalogue held at Camden Park [CPA]. In William Macarthur’s code, used and explained elsewhere, this means grown at Camden. It is almost certain that it was grown in the gardens around this time but it did not appear in the catalogues and may have been short-lived. This species grows in the Camden area and was probably collected locally.